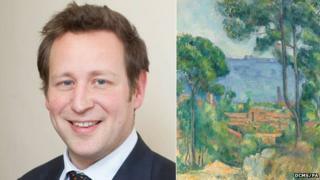 Image caption Culture minister Ed Vaizey (left) said he hoped the Cezanne (right) would "soon be back on the walls of one of our great public collections"
The government has taken steps to stop a masterpiece by 19th Century French artist Paul Cezanne leaving the UK. A temporary export bar has been placed on Vue sur L'Estaque et le Chateau d'If, a fixture at the Fitzwilliam Museum in Cambridge for three decades. A UK buyer is being sought to match the £13.5m asking price for the painting, which dates from around 1883 to 1885. Culture minister Ed Vaizey said he hoped the bar would stop the "quietly beautiful" artwork going overseas. "For almost 30 years this... painting has adorned the walls of the Fitzwilliam Museum where it has been enjoyed by countless visitors," he said. "I hope that the temporary export bar I have put in place will result in a UK buyer coming forward and that the painting will soon be back on the walls of one of our great public collections." The painting was acquired in 1936 by Samuel Courtauld and stayed in the art collector and industrialist's family until its sale to a foreign buyer in February. The decision on the export licence being requested for the oil painting - a view of the Bay of L'Estaque on the Mediterranean at Marseilles - will be deferred until 21 December.